Shea and Coconut Fluff Face and Body Moisturizer utilizes two basic ingredients for intensive skin care: shea butter and coconut oil. No added water! No added water means little risk of spoiling from bacteria and mold growth. Whipped to achieve a fluffy, non-greasy consistency, this combination is a suburb, skin nourishing moisturizer for both face and body, both men and women. 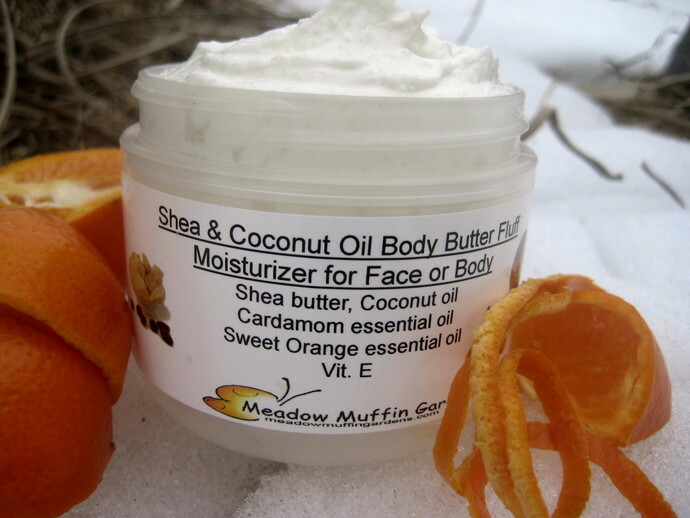 A soothing aid for irritated skin conditions, Shea and Coconut Fluff helps moisturize and heal. Also makes a nice after shave balm. Shea butter comes from karite nut trees found in Africa. Some call shea butter African cocoa butter. These nuts are crushed and boiled to extract the sought after fat. It is a heavy butter, but once it penetrates the skin this method of skin care is very therapeutic for healing and moisturizing dry, sensitive skin and even helps fade those fine lines. 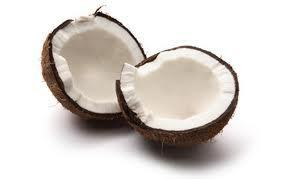 Coconut oil is found inside coconut shells. To extract this oil the coconut meat is crushed and heated in boiling water. The floating oil is then skimmed off and collected. Coconut oil melts above temperatures of 76 degrees, therefore this body butter will soften if exposed to heat. Known for its ability to help skin retain moisture, this wonderful hydrator is often used for bothersome dry skin and as a hair conditioner. Note: If you are allergic to coconut oil or just prefer shea butter, this fluff can easily be made with just shea butter and leave out the coconut oil. Just let me know. Cardamom is a spice from India and used in Ayurvedic medicine. It is described as warm, green and spicy. Cardamom is warming yet stimulating. Paired with citrusy Orange and you have a cold weather comfort blend for winter dry skin. 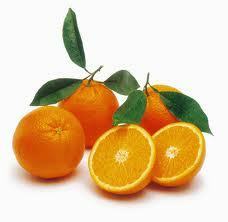 Sweet Orange is a sunny, happy, uplifting scent and goes nicely with spicy Cardamom. The combination is nice for easing tension and just feeling better. Cardamom and orange are on the safe list during pregnancy. If you prefer another scent or none at all, please let me know. Normally I use unrefined shea butter for the full therapeutic benefits. 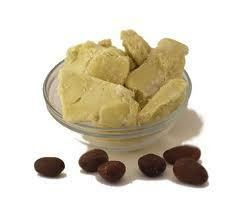 However, unrefined shea butter has a pleasant odor of its own but tends to mask the scent of added fragrances. To achieve a whiter look and to enable the aroma to be at its best I'll use refined shea butter for the body butter fluffs.The refined has been refined specifically to eliminate the scent; this is done by filtration through activated charcoal and diatomaceous earth. This should not effect the nutrients in the oil. If you want the unrefined please let me know. Shea butter can be very touchy with temperature fluctuations, resulting in a chemical change which makes it feel a bit gritty. Very frustrating is when it arrives like that from the supplier. Should this be the case with your order, keep in mind that upon application to the heat of your skin that feeling will disappear shortly. Ordinarily, I use refined coconut oil for the reason that not everyone enjoys the smell of coconuts. To avoid the smell of coconuts interfering with the final scent of the product (either the scent-free cream or the essential oil blends), I use the refined coconut oil unless by request to use the unrefined. But note that the smell of coconut does go nicely with Cardamom and Orange, so let me know if you want me to use the unrefined instead. Below is a bit of information to explain the differences between the refined vs. unrefined. The differences between refined and unrefined coconut oils used for my products are in how the oil is processed. There are refined coconut oils on the market that use a chemical distillation process dependent on solvents such as lye. These products may be hydrogenated using high heat which should be avoided as they create synthetic trans-fats. The refined coconut oil I use are refined using a natural, chemical-free cleaning process involving steam and/or diatomaceous earth. The cold pressed extraction method yields an oil of higher nutritional value than extraction methods that use chemicals or heat. Creams made with the unrefined coconut oil do have a noticeable scent of coconut, however it is pleasant and not at all overwhelming. 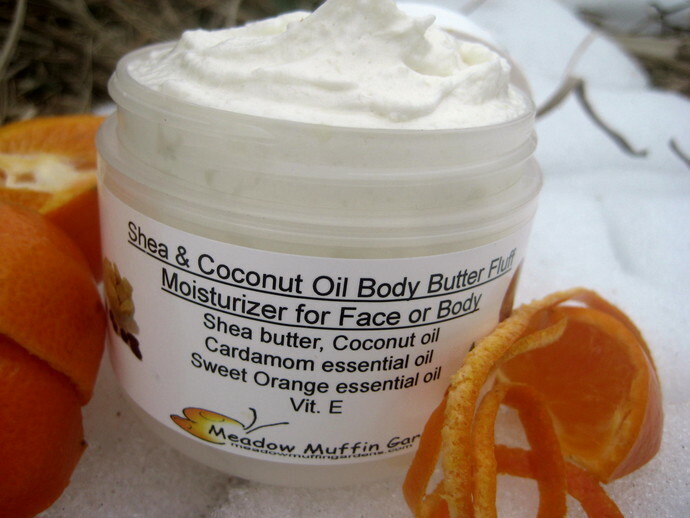 Shea and Coconut Fluff Face n' Body Moisturizer comes in a 4 oz. plastic jar.